Even to people that watch old movies, dancer Vera-Ellen is mostly known to the world as the younger sister of Rosemary Clooney in the movie WHITE CHRISTMAS(1954). However, she was a great dancer who had many demons that 1940s and 1950s audiences never knew. She was born Vera Ellen Westmeier Rohe on February 16, 1921 in Norwood, Ohio , an enclave within Cincinnati, to Martin Rohe and Alma Catherine Westmeier, both descended from German immigrants. She began dancing at age 10 and quickly became very proficient. At 16 she was a winner on the Major Bowes Amateur Hour, and embarked upon a professional careerIn 1939, Vera-Ellen made her Broadway theatre debut in the Jerome Kern/Oscar Hammerstein musical Very Warm for May at the age of 18. She became one of the youngest Rockettes at Radio City Music Hall, although she was not tall. This led to roles on Broadway in Panama Hattie, By Jupiter, and A Connecticut Yankee, where she was spotted by Samuel Goldwyn, who cast her opposite Danny Kaye and Virginia Mayo in the film WONDER MAN(1945). She danced with Gene Kelly in the Hollywood musicals WORDS AND MUSIC(1948)and ON THE TOWN(1949), while also appearing in the last Marx Brothers film, LOVE HAPPY(1950). She received top billing alongside Fred Astaire in Three Little Words and The Belle of New York (1952). Then came co-starring roles with Bing Crosby in the blockbuster hit WHITE CHRISTMAS(1954). During the 1950s, she was reputed to have the "smallest waist in Hollywood", and is believed to have suffered from anorexia nervosa. She retired from the screen in 1957. Guest appearances on the television variety shows of Dinah Shore and Perry Como in 1958 and 1959 were among the last of her entertainment career. A good dancer though in film she had to suffer the indignity of miming to the singing of others. David, you forgot to mention that her full name was Vera Ellen Westmeier Rohe, born 16th February 1921, "Westmeier" and "Rohe" being the surnames of her mother and father respectively. So for professional purposes she dropped both her parents' surnames. An inconsequential but interesting oddity is that in the film "White Christmas" she plays the younger of two singing sisters - "The Haynes Sisters", but was actually seven years older than Rosemary Clooney, playing the older sister. I just saw her dance on the "dinah shore show" she was really amazing. I can't believe that was one of her last appearances. This woman was hot, seems like she could have done alot more. I'm setting here watching White Christmas. 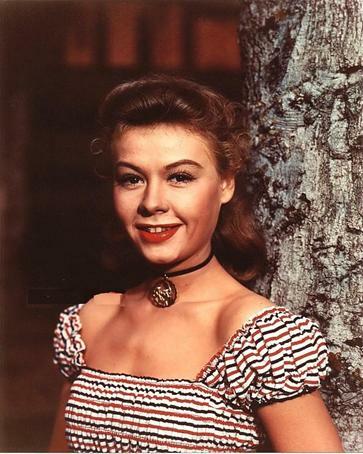 It is so sad we lost an actress the likes of Vera-Ellen as young as she was. I have grown up all my life (56) during the Christmas season, the one thing you had to watch White Christmas. If there would be one person I would have meet would be her. You are missed. Tremendous dancer and a true talent. Too bad about her vocals being dubbed throughout the movie White Christmas. She made Danny Kaye look much better as she was a gifted performer! My first love, and i still haven't seen a better pair of legs!